Company’s report prepared in accordance with GRI Standards: Core option, highlights TCFD involvement and continued focus on environmental, social and governance (ESG) activities. 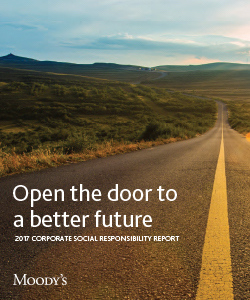 Moody’s Corporation’s newly released Corporate Social Responsibility (CSR) Report details the company’s progress in delivering on its goal of empowering people around the world to create a better future for themselves, their communities and the environment. The report details Moody’s ongoing initiatives to support financial empowerment, as well as in each of its other areas of focus: activating an environmentally sustainable future, helping young people reach their potential, and sharing our passion and purpose with the world. Moody’s Investors Service incorporates environmental, social and governance (ESG) considerations into its credit analysis, with a dedicated team that helps global investors, governments and issuers understand the links between sustainability and credit risk. In addition, Moody’s Green Bond Assessments (GBAs) provide vital information to investors on the governance of new green bond issuances, including the disclosure of information and how the proceeds are used. As of June 30, 2018, Moody’s had assessed 40 green bonds worth almost $19.5 billion, empowering investors with the information they need to confidently make investments in projects that benefit the environment. Further, the Moody’s Foundation supports Trees For Life, which aims to preserve and restore Scotland’s Caledonian Forest. Moody’s established a grove of 3,600 native trees and adds to the grove each time a GBA is published. Moody’s also maintains a clear focus on its own environmental impact. In 2017, despite a 7% increase in physical footprint, Moody’s Scope 1 and 2 greenhouse gas emissions fell by 9%, the equivalent of keeping 355 cars off the road for a year. Moody’s supports a range of initiatives to help young people reach their potential through mentoring, skills-development programs and internships. Moody’s sponsors a computing and professional skills program with Girls Who Code for high school students in San Francisco and New York, encouraging young women to bring their talents to careers in finance, technology and economics. Moody’s employees play an integral role in driving CSR through volunteer efforts, contributions of pro bono expertise and board service on behalf of nonprofits. The report details ways in which Moody’s employees demonstrated their commitment to local communities, from helping a South African primary school provide fresh vegetables for its students, to offering data analytics expertise to the Hetrick-Martin Institute, which supports LGBTQ young people in New York and New Jersey. To learn more about Moody’s Corporate Social Responsibility, visit its CSR website. Moody's is an essential component of the global capital markets, providing credit ratings, research, tools and analysis that contribute to transparent and integrated financial markets. Moody’s Corporation (NYSE:MCO) is the parent company of Moody's Investors Service, which provides credit ratings and research covering debt instruments and securities, and Moody's Analytics, which offers leading-edge software, advisory services and research for credit and economic analysis and financial risk management. The corporation, which reported revenue of $4.2 billion in 2017, employs approximately 12,000 people worldwide and maintains a presence in 42 countries. Further information is available at www.moodys.com.